The global animal feed enzymes market has a highly consolidated vendor landscape, says Transparency Market Research, in a recently published report. Azelis Holdings, Novus International, Bio-Cat, Rossari Biotech, and Associated British Foods are the top companies working in the global animal feed enzymes market. A key strategy deployed by players in the global animal feed enzymes market to outshine their rivals is proxuct development. They are seen focussing hard on product differentiation and expansion of product portfolio to steal a march over competitors. Regulating costs with delivering quality products is a key strategy of most businesses present in the global animal feed enzymes market. 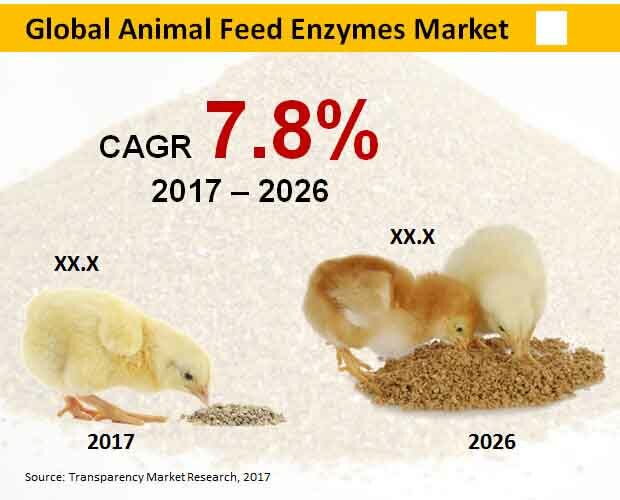 According to experts from Transparency Market Research, the global animal feed enzymes market is expected to gain revenue worth US$100 mn by the end of 2026. Experts project this growth to occur at a fantastic CAGR of 10.10% during the forecast period from 2017 to 2026. Among the various key products in the market, growing demand for carbohydrase is expected to boost the global animal feed enzyme market. This is because cabohydrase intake helps in improving digestion and nutritional absorption. Geographically, North America is leading the global animal feed enzyme market as the region has seen rising demand for quality meat products. Growing incidence of zoonotic diseases such as avian flu, increasing cases of various food borne diseases, and rising mortality rate of animals are believed to be driving the global animal feed enzymes market. European Food Safety Authority have declared that around 220,000 cases of zoonotic diseases such as campylobacteriosis and food borne diseases in 2012. Thus, the growing demand for adequate phytogenic nutrients, amino acids, and probiotics for animal health benefits is boosting the global animal feed enzyme market. Furthermore, many manufacturers are adopting nanotechnology to boost the drug absorption and digestive capacity in the livestock. This helps in producing better quality meat, expanding the lifespan of animals, and reducing the chances of developing diseases. There are many animal feed enzymes available in the market, namely proteases, carbohydrases, and phytase. These enzymes help in maintaining animal health, digestability, hygiene, and also intestinal health. Rising awareness among customers regarding meat quality, food safety, growing demand for high quality meat products, and increasing adoption of ready-to-eat and frozen food products are projected to propel the global animal feed enzyme market. A few challenges hindering the growth of the global animal feed enzymes market is cost-sensitivity of production of animal feed enzymes, and less choices in the area of innovating new products. Nonetheless, increasing demand for quality dairy products and foods are expected to help overcome some of these challenges in the near future. The review is based on a market research report by TMR, titled, “Animal Feed Enzymes Market (Product Type - Phytase, Carbohydrase, Proteases, Poultry, Ruminants, Swine, Aquatic, Other; Form - Liquid, Dry) - Global Industry Analysis, Size, Share, Growth, Trends and Forecast 2017 – 2026”.